A wealth of research has focused on the technology integration behaviors of preservice teachers, with much of that literature centering on technology and methods coursework within teacher education programs. However, less emphasis has been placed on understanding the impact of field placement observations on a preservice teacher’s technology integration intentions. 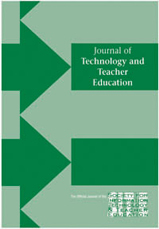 This study investigates how witnessing a mentor teacher utilizing technology in the field impacts an early preservice teacher’s intentions to use technology in future practice, and how factors such as the mentor teacher’s TPACK might moderate that effect, with the perceived ease of use and perceived usefulness of observed tools serving as potential mediators. The findings indicate that a mentor teacher’s TPACK conditionally impacts how technology observations affect early preservice teachers’ intentions to personally use technology. For teachers with high TPACK scores, preservice teachers wanted to use technology more as they saw their mentor teachers using it more frequently. The reverse was true for teachers with low TPACK scores. The findings suggest that a mentor teacher’s self-described ability to teach his or her subject with technology plays an important role in how preservice teachers make personal judgments about their own technology usage. The perceived usefulness and perceived ease of use of technology by the preservice teacher did not, however, mediate the influence of the mentor teachers. Nelson, M. (2017). The Role of a Mentor Teacher’s TPACK in Preservice Teachers’ Intentions to Integrate Technology. Journal of Technology and Teacher Education, 25 (4), 449-473. Waynesville, NC USA: Society for Information Technology & Teacher Education. Retrieved April 21, 2019 from https://www.learntechlib.org/primary/p/178211/.